ABC/Heidi GutmanGreen Day fans may do a double-take if they come across the cover for rapper Vince Staples‘ new album, FM! The artwork is a clear homage to the punk trio’s 1994 classic Dookie, and frontman Billie Joe Armstrong approves. Both covers feature the same 3-D lettering typeface and a Where’s Waldo?-esque art style. If you look closely, you can see some of the same characters, including a representation of God in the upper right-hand corner. 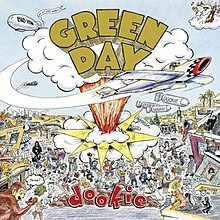 Over the summer, Green Day teased that they had been rehearsing Dookie in full, leading to speculation that the band might be planning something in honor of the album’s upcoming 25th anniversary next year. They then revealed that they also have been rehearsing 1991’s Kerplunk and 1995’s Insomniac, making it less clear what they’re planning, if anything.